Safe Tech for Schools Maryland: Massachusetts Public School District Reduces Wireless Radiation In Schools With Mobile Device Best Practices. Massachusetts Public School District Reduces Wireless Radiation In Schools With Mobile Device Best Practices. Read this letter by Cece Doucette detailing how Ashland public schools is taking steps to reduce exposures in classrooms with mobile device best practices which as posted in every classroom. "In the absence of a higher authority able to tell them what to do, our School Committee adopted the attached Best Practices for Mobile Devices to at least do what the manufacturers advised with creating distance, and turning devices and wi-fi off when not in use. Little did I know we were the first public school in the nation to take even this first step." Please allow me to introduce myself, my name is Cece Doucette and I would like to share important information we are making available to our Ashland, Massachusetts community on the topic of wireless radiation relative to its impact on the health of humans. I hope you will investigate this issue and consider implementing similar outreach in Montgomery County so your citizens may begin to understand the potential health effects of this little-known, yet serious health matter. A couple of years ago an electrical engineer friend mentioned something about wi-fi being potentially harmful, and I made a mental note of it and filed it away. Then a bit later I heard this again from another source. I had lead our local education foundation for eight years and personally ran campaigns to bring technology into our schools. Following that, I worked directly for our school district as our grant coordinator and helped our teachers secure many iPads, Chromebooks, smartboards, Apple TVs, etc. I felt morally obliged to look into this issue. What I found was astounding. I am a technical writer by trade, so to help me keep track of the volume of information available on this topic, I created a simple repository to organize my findings. I welcome you to peruse Understanding EMFs. Of course, none of these devices can be operated without touching them, so by simply using our devices with wi-fi on we are exceeding the FCC guidelines. Those guidelines were put in place in 1996 and the only testing done was to see how much heat it would take from a single device to burn the skin of a six-foot, 220 pound military model. No testing was ever done on fetuses, children, the elderly or those with known health issues. No testing has ever been done on the ubiquitous way in which we now use technology: a multitude of devices sending and receiving signals at once; industrial strength routers at school and in public libraries; cell towers placed close to school children, the elderly, on hospitals; “smart” utility meters mounted on our homes; DECT cordless phones that serve as private cell towers in our homes; private routers that pulse radiation 24/7. The sum total never allows our bodies a chance to rest and cell regenerate properly and the fallout is beginning to show. My heart broke last week when the news report came out about a teen girl in England who committed suicide after becoming electrohypersensitive and not being given accommodations in school. Our current guidelines address only the thermal, or heat effect. Science has long since identified there is great potential harm at the non-thermal, non-ionizing level well below what the FCC allows. Not only has the FCC failed to update their guidelines but the gentleman who now runs our FCC, Tom Wheeler, suppressed evidence of harm back in the 1990s when he was the chair of the Cellular Technology Industry Association (now called CTIA-The Wireless Association). Harvard University’s Center for Ethics published a paper on June 30th explaining how this came to be. Please see Captured Agency. Thus, wireless technology has been allowed to proliferate without ever having been properly safety tested and now it is everywhere. Our school district was caught between a rock and a hard place. Technologists and engineers in our community knew only what the FCC espoused, saying wi-fi is fine, and were very vocal about not veering from our current wireless course. Yet, there were thousands of peer-reviewed non-industry funded scientific papers from experts all over the world stating otherwise and asking citizens and governments to take the precautionary approach by accessing technology via hard-wired Ethernet or fiber optic connections instead of wi-fi. Some countries havedone so, but not the U.S. 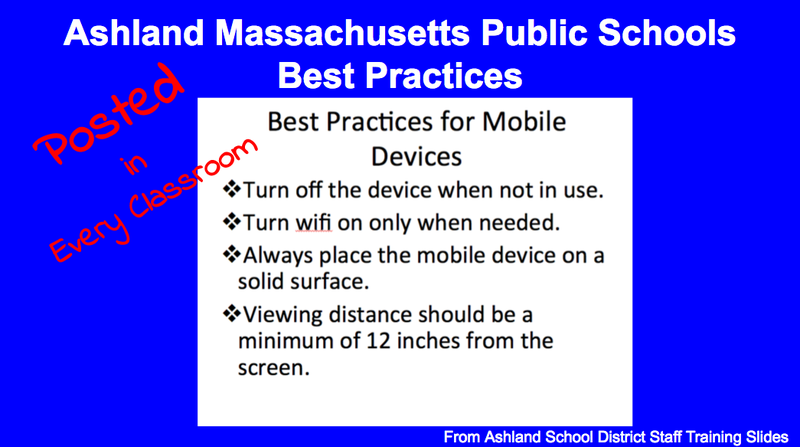 In the absence of a higher authority able to tell them what to do, our School Committee adopted the attached Best Practices for Mobile Devices to at least do what the manufacturers advised with creating distance, and turning devices and wi-fi off when not in use. Little did I know we were the first public school in the nation to take even this first step. When I spoke to our town administrators, potential harm from wi-fi radiation was news to everyone except our Town Manager. He had been a fighter pilot and our government still checks in with him to see if he’s suffered any radiation fallout. Our local health agent suspected our municipal hands were tied because the FCC ensured in the Telecommunications Act that folks cannot claim damages if someone’s health is compromised by cell tower exposure. He was gracious to reach out to our Massachusetts Department of Public Health, but they were not versed in this issue either. Fortunately, we have since learned the industry does not have a lock on wi-fi like they do with cellular licensing and municipalities can take independent action. So, I met with my local State Senator and by that time had purchased a meter to measure the radiation output from our devices. I measured her cell phone and her district director’s laptop, and both measured off the charts. In January of this year, she introduced a brief piece of legislation to bring bright minds together to examine this issue, provide our citizens with the right to know about wi-fi radiation, and instruct on ways to use our devices more safely. Feel free to reference MA Senate Bill 1222. Since May of this year, more than 200 international scientists have made an Appeal to the United Nations, all its’ member States, and the World Health Organization. The signers of the Appeal, all of whom have produced peer-reviewed science on RF-radiation, state thatemission guidelines are not protective of human health, that we are on the verge of “an emerging public health crisis,” leading to premature death and damage to our DNA. They ask for several actions, including alerting the public, protecting children and others most vulnerable, creating white zones, and training physicians to treat those becoming electrohypersensitive. As the proliferation of wireless radiation grows it becomes impossible to evade even in public spaces and, yet, most people are unaware of the radiation they are being exposed to. You might think of it like another air transmitted toxin, natural gas. Until the odor was added, one couldn’t detect it but it was there and very harmful. This is of great significance in regard to cellular and wi-fi radiation exposures on the health and well being of our community and ourselves because the harm is cumulative. We are now beginning to see legal action as evidenced here as people seek protections and public access to wi-fi free white zones. As with cigarette smoking and asbestos, it could take many years for this to be sorted out by our government and international agencies, but there is much we can do on an individual and community basis to lessen our exposure in the meantime. The first step is to get educated. I was pleasantly surprised when another member of our community studied this issue and established our Friends of the Library fall film and discussion series entitled Electromagnetic Radiation (EMR) and Health. Attached is the flyer containing detailed information, which could easily be mirrored or modified in Montgomery County. I hope you will agree the public library is an excellent place to provide educational information, employing good use of public facilities and encouraging community engagement. I believe Montgomery County residents would be appreciative of your efforts to create a public forum for education and discussion of this important issue. While it is expected there will be differing perspectives on any new topic, all are in agreement that a right to know is important. As with cigarettes, alcohol and drugs, folks will do what they wish with the information, but at least they have a right to know about this toxin classified by the World Health Organization as a Class 2B Possible Human Carcinogen – right up there with lead, DDT, and chloroform. Our non-industry-funded scientists implore us to use hard-wired connections, I hope you will work toward this solution in your school district and public facilities to minimize further radiation exposure and create safe spaces for those already suffering. Our talks have been lively here in Ashland, but respectful, and our community is richer and safer for it. Thank you very much for your time and consideration, please don’t hesitate to reach out if I can offer additional insights. Video of CeCe Doucette talking on the subject. Video of school board member discussing the process. Read Massachusetts Magazine article on Ashland’s Decision Here.